In Rod Serling’s update of Charles Dickens, industrial tycoon Daniel Grudge has never recovered from the loss of his 22-year-old son Marley, killed in action during Christmas Eve of 1944. The embittered Grudge has only scorn for any American involvement in international affairs. But then the Ghost of Christmas Past takes him back through time to a World War I troopship. Grudge also is visited by the Ghost of Christmas Present, and the Ghost of Christmas Future gives him a tour across a desolate landscape where he sees the ruins of a once-great civilization. I remember seeing this on ABC when it first ran in 1964, and then not again until TCM picked it up two years ago. It was the first of a short series of dramatic specials about the work of the United Nations. The only bit I remembered was a few seconds of Peter Sellers as the “Imperial Me,” the dictator of Grudge’s home town following a nuclear war. The script was by Rod Serling, so it was wordy and overly melodramatic. 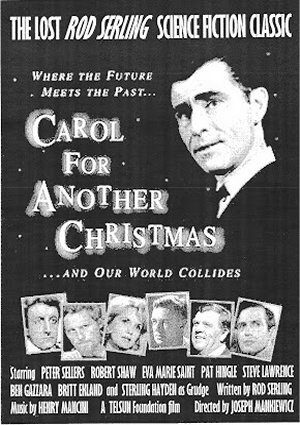 Worse, Henry Mancini’s theme for the special was dropped in favor of standard carols. Mancini’s “Carol for Another Christmas” is a beautiful piece of music, and it might have helped elevate the entire show.